Great! You came to look at my short interview with Joe Simpson, about his relationship with his father. What I’m writing about here is very important. As important as it gets. We wandered over. There was a bit of suspicion: what were these two white guys doing? I introduced myself, said I was from the Financial Times. I left him to introduce himself. And they invited us inside. And that’s OK. It was good to see him, nodding modestly and smiling, as he was treated like a guest by these people he’d despised. I don’t know exactly what he made of it, but I’m pretty sure it had some kind of impact. The thing I want to draw your attention to is this: conversations like that don’t just happen. They have to be engineered. 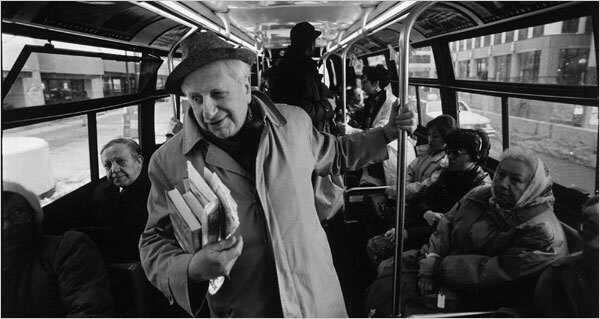 Which reminds me of one of my heroes, Studs Terkel. Terkel was a legendary journalist who used to talk to ordinary people on the street, on buses – anywhere – to capture stories that would otherwise never be heard. I’m a big fan. If you get the chance, you should read Terkel’s book Working, about the extraordinary experiences people have, just doing ordinary jobs. It takes skill, to launch into that kind of conversation. While they’re thinking: Who is this character? How can I escape?!! If you haven’t done it before, you might need help. Terkel did it a lot. He had practice. As a result, the people who talked to him tended to feel pretty good about it afterwards. They’d got something off their chest – something they probably didn’t often get the chance to say. I know myself how powerful that is, because I once spent just five minutes talking to somebody about something, and those five minutes changed my life. I’ll tell you about it some time. I’m coming to that. It’ll soon be clear.